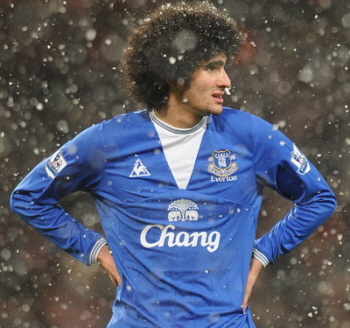 Man Utd chase Real Madrid midfielder, Marouane Fellaini to Chelsea? Rumour No. 1: Manchester United are tracking the lesser of Real Madrid’s Diarras – Mahamadou – with the intention of the Mali international replacing Anderson in the centre of United’s midfield. It is hoped a £4 million bid would secure the services of the Madrid man who has recently been deployed as a specialist bench-warmer since he joined Los Blancos four years ago. The 28 year old is a skilled defensive midfielder but surely Man Utd would be better off trying to prise his (younger and better) namesake Lassanna Diarra from Madrid? Rumour No. 2: Chelsea are ‘keeping tabs’ on Everton midfielder Marouane Fellaini, according to the player’s father and agent, Abdel Fellaini. The Belgian has been impressing in a more defensive role for The Toffees after being deployed, rather unconvincingly, as a forward earlier in his Everton career. After being voted man-of-the-match three times in his last five games, Chelsea have stepped up their interest in the mono-browed midfielder, presumably under the premise that anybody would be better than John Obi Mikel. Can’t see it happening though. The Best of the Rest:Inter Milan, Chelsea, Manchester United and Manchester City are slugging it out to sign Benfica’s wing wonder Angel Di Maria for £15 million. Tottenham Hotspur have recently been linked with a move for Croatian centre back Dejan Lovren but the Dinamo Zagreb defender looks set to join Lyon this week. Aruna Dindane looks to have played his last game in a Portsmouth shirt as his parent club Lens are to recall him, citing a lack of funds at Pompey to be the reason for the withdrawal. Wigan manager Roberto Martinez has targeted Real Mallorca striker Aritz Aduriz as a possible replacement for Hugo Rodallega should the Colombian have his head turned by a big-money move in January. Birmingham and Wolves have both expressed their interest in taking Stephen Hunt from Hull City. The Tigers desperately need to slash their wage bill and the West Midlands rivals are willing to do their bit to help. After being told he has no future at Birmingham, winger Gary McSheffrey has been offered a chance to revive his flagging career at Sheffield United. He’d be a replacement for Marlon King, not Rodallega…why do every paper assume that we’re going to be happy leaving ourselves with only the useless Jason Scotland up front?